September 12, 2016 - Mahindra & Mahindra Ltd. (M&M), India’s leading SUV manufacturer, today unveiled - The New Bolero Power+ with the mHawkD70 engine. Mumbai, November 17, 2015: Laleh Seddigh, Iran's foremost lady rally driver and leading sports personality is all set to visit India on November 19, 2015. At the invitation of team Mahindra Adventure, Iran’s numero uno lady rallyist will exchange views & experiences with Mahindra Adventure motorsport drivers, on the side lines of the rally at the Bengaluru stage of the Indian Rally Championship. A name to reckon with in the Iranian motorsport circuit, Laleh started driving at the tender age of 13. Always passionate about cars and driving, Laleh is popularly referred to as the "Little Schumacher". In fact she is the only female driver to be given permission by the Iranian authorities to participate in an otherwise male dominated bastion in her home country. With many accolades to her credit spanning her illustrious career, Laleh has proved her mettle in the motorsport circuit in Iran, securing many podium finishes and first places across races and rallies. Speaking on the occasion, Anand Mahindra, Chairman, Mahindra Group said, "I would like to welcome Laleh to India and it is our pleasure to host her. Women are proving themselves in professions which had otherwise been male dominated for years and Laleh has played her cards with much confidence. A role model for the youth who wants to excel not just in motorsports but in any arena, she epitomizes the spirit of women empowerment like no other. Having stormed the male bastion of motorsport in her country and fighting all odds to come out on top, she clearly symbolizes the take on anything spirit. Finally if anything, her achievements are completely in sync with our Rise philosophy of accepting no limits." Looking forward to her India trip, Laleh Seddigh said, "I am very excited to experience the motorsport scene in India and would like to thank team Mahindra Adventure for providing me this platform to exchange thoughts & experiences with their rally drivers. I cannot wait to watch the rally prepared Mahindra XUV500s in action, sliding and drifting off the curves. I truly believe that motorsport has immense potential to be recognized as a mainstream sport and in my own way I would like to encourage more people to take it up as their profession, as a serious sport. Such free flowing interactions will not only bring in cross country perspectives, but I am sure this will also provide the right impetus for more support and an increased visibility for a sport which so far has been a playground for a select few". A unique customer-centric initiative focused on the vehicle's fuel efficiency Mileage Rally takes Bengaluru by storm. Bengaluru, January 13, 2014: Mahindra & Mahindra Ltd. (M&M Ltd.), India's leading SUV manufacturer, recently organized the 'Bolero Mileage Rally' in Bengaluru, Karnataka, a unique event aimed at creating a platform for interacting with its customers and highlighting the vehicle's superior mileage. The event was actively attended by more than 100 people. Bolero customers and their families assembled at Manipal County Resort in Bengaluru. All the participants were given a route map for navigation and all vehicles had to fill up their tanks to the maximum before they were flagged-off. The fuel was filled in the presence of neutral marshals to prevent any misreporting of mileage figures. The rally covered a distance of over 60 km. Before returning to the starting point, the amount of fuel consumed was measured and mileage was determined. All participants showed great enthusiasm and were able to average very good mileage, a particularly impressive feat given the traffic heavy road conditions, in the centre of Bengaluru. The winning vehicle, a Bolero ZLX, clocked an excellent mileage of 30.16km/litre, followed by another Bolero ZLX, clocking an average of 28.57km/litre. The third prize went to the Bolero that averaged 26.24km/litre. Since its launch in August 2000, the Bolero has evolved significantly, incorporating a host of features and aesthetics in line with the changing lifestyle and aspirations of Indian consumers. Mahindra has kept up the momentum with constant product upgrades and new offerings, having launched the 'New Bolero'in 2011. Powered by the refined, peppy new m2DiCR engine with better drivability and excellent fuel efficiency, the New Bolero sports more macho front styling, giving it an aggressive stance. It also incorporates new technology features like Advanced Digital Display with Driver Information System (DIS) and a digital Engine Immobilizer, all-new stylish dashboard, new wood-finish centre console and all-new seats and upholstery. The brand's popularity is also visible in the online space. The Mahindra Bolero community on popular social networking site, Facebook, has over 14 lakh fans sharing their adventures and experiences in the Bolero. The YouTube channel of the brand has received more than 3 million views. Bolero has also been associated with popular celebrities such as cricketers, Gautam Gambhir and Robin Uthappa who own a Bolero Stinger and a Bolero Special Edition, respectively. More recently, the London 2012 Olympic Bronze medal winner and boxing champion, MC Mary Kom, was felicitated with a Bolero. A USD 16.7 billion multinational group based in Mumbai, India, Mahindra employs more than 180,000 people in over 100 countries. Mahindra operates in the key industries that drive economic growth, enjoying a leadership position in tractors, utility vehicles, information technology and vacation ownership. In addition, Mahindra enjoys a strong presence in the agribusiness, aerospace, components, consulting services, defence, energy, financial services, industrial equipment, logistics,real estate, retail, steel, commercial vehicles and two wheeler industries. In 2012, Mahindra featured on the Forbes Global 2000 list, a listing of the biggest and most powerful listed companies in the world. In 2013, the Mahindra Group received the Financial Times 'Boldness in Business' Award in the 'Emerging Markets' category. October 30, 2013, Mumbai: Mahindra & Mahindra Ltd. (M&M Ltd.), India's leading SUV manufacturer, today announced that its flagship Sports Utility Vehicle (SUV) brand, the Bolero, has achieved a new sales milestone with over 6.5 lac vehicles on Indian roads. Launched in 2000, the Bolero is an aspirational, tough and rugged, entry level SUV with macho styling and go anywhere capability, which has been dominating Indian roads for 13 years. The Bolero is India's No.1 SUV for 7 years in a row and also the 5th highest selling passenger vehicle in India during April - September 2013. Over 6.5 lakh Boleros are already on Indian roads which is a testimony to the confidence that consumers have in the brand. Further, the Bolero topped the TNS Automotive Total Customer Satisfaction Study 2012. With an unbeatable value for money proposition, which combines affordable pricing, low maintenance costs and high resale value, the Bolero's popularity has soared over the years. The iconic SUV sold 1,17,665 units in FY-2013, as against 1,00,686 units during FY-2012, registering a growth of 17% becoming the only Indian SUV to sell over 100,000 vehicles, for 2 years in a row. Commenting on this milestone, Pravin Shah, Chief Executive - Automotive Division, Mahindra & Mahindra Ltd. said, "Having sold over 6.5 lakh units since inception and ruling the roads for 13 years, the Bolero has transformed the SUV space in the country. Over the years, the Bolero has been updated and evolved with the changing lifestyle and aspirations of its customers resulting in its growing popularity. Ruling roads and hearts across the country, the Bolero has moved from strength to strength, to enhance the lifestyle, fun and adventure quotient of consumers". Since its launch in August 2000, the Bolero has evolved significantly, incorporating a host of features and aesthetics in line with the changing lifestyle and aspirations of Indian consumers. Mahindra has kept up the momentum with constant product upgrades and new offerings, having launched the 'New Bolero' in 2011. Powered by the refined, peppy new m2DiCR engine with better drivability and excellent fuel efficiency, the New Bolero, sports more macho front styling, giving it an aggressive stance. It also incorporates new technology features like Advanced Digital Display with Driver Information System (DIS) and a digital Engine Immobilizer, all- new stylish dashboard, new wood-finish centre console and all-new seats and upholstery. The brand's popularity is also visible in the online space. The Mahindra Bolero community on popular social networking site, Facebook, has over 12 lakh fans sharing their adventures and experiences in the Bolero. The YouTube channel of the brand has received more than 3 million views. Bolero has also been associated with popular celebrities such as cricketers Gautam Gambhir and Robin Uthappa who own a Bolero Stinger and a Bolero Special Edition, respectively. More recently, the London 2012 Olympic Bronze medal winner and boxing champion, MC Mary Kom, was felicitated with a Bolero. The 2012 Olympic medal winner ready to 'Take on Anything' with Mahindra Bolero. New Delhi, October 4, 2012: Mahindra & Mahindra Ltd. (M&M), India's leading SUV manufacturer, today felicitated London 2012 Olympic Bronze medal winner, MC Mary Kom, with its best-selling Sports Utility Vehicle (SUV), the 'Bolero'. The felicitation symbolizes the association of two strong entities both with the spirit of 'Taking on Anything' - 'MC Mary Kom' and 'Mahindra Bolero'. Built to take on anything from bad roads to bad weather, the tough and rugged Bolero is a perfect match with Mary Kom's ability to boldly take on competition in the boxing ring. The 'Mahindra Bolero' is an ideal vehicle for India's champion boxer, who, with her explosive performance at the recently concluded London 2012 Olympics, personified the Bolero attitude of 'taking on any challenge'. In fact, Mary Kom is the epitome of Mahindra's RISE philosophy by storming an otherwise male-dominated bastion by 'Accepting No Limits'. She is also 'Driving Positive Change' - another element of Mahindra's RISE ethos by altering society's perception of what a courageous, confident and determined woman can achieve. Presenting the keys to the Olympic medal winner and 5 times world boxing champion, Mr. Vivek Nayer, Chief Marketing Officer, Automotive Division, Mahindra & Mahindra Ltd. said "We are proud to be associated with MC Mary Kom. She has become a role model for the youth in India who wants to excel not just in sports but in any arena. Fighting all the odds to come out on top, she clearly symbolizes the 'take on anything' spirit of the Bolero SUV. With its rugged looks and plush interiors, the all-conquering Mahindra Bolero is the ideal choice for Mary Kom to make a personalized style statement." While receiving the keys to the vehicle, MC Mary Kom said, "I am very pleased to own the Bolero and I thank Mahindra & Mahindra for this very special gesture. With its rugged looks and power-packed performance, the Bolero is indeed a great compliment to my personality and I am looking forward to owning and driving this stylish SUV." Despite being an Olympic medal winner and 5 time world boxing champion, the holder of 3 Asian titles and 11 national titles, an Arjuna Award winner, a Padma Shri Award winner, a Rajiv Gandhi Khel Ratna Awardee, Mary also fulfills her roles as a mother, wife and daughter, with complete élan. The Bolero is India's No.1 SUV for 6 years in a row, a validation of the superior value proposition it offers along with its ability to traverse all kinds of terrain. Since its launch in August 2000, the Bolero has evolved significantly, incorporating a host of features and aesthetics in line with the changing lifestyle and aspirations of Indian consumers. Mahindra has kept up its momentum with constant product upgrades and new offerings, having launched the 'New Bolero' recently. Powered by the refined, peppy new m2DiCR engine with better driveability and excellent fuel efficiency, the New Bolero, sports more macho front styling, giving it an aggressive stance. It also incorporates new technology features like Advanced Digital Display with Driver Information System (DIS) and a digital Engine Immobilizer, all- new stylish dashboard, new wood-finish central console and all-new seats and upholstery. The Bolero is yet again the highest selling SUV in India for the 6th consecutive year with sales of 1,00,686 units during FY 2011-12, as against 83,112 units during FY 2010-11, registering a growth of 21%. This is by far its highest ever annual sales since launch. The Bolero has also notched up the 5th position among the top selling passenger vehicles in India YTD August 2012, moving up from 7th in FY2011 – 12. What is significant is that the Bolero is the only SUV to feature among the top 10 selling passenger vehicles in India. The brand's popularity is also visible in the online space. The Mahindra Bolero community on popular social networking site, Facebook, has over 8 lakh fans sharing their adventures and experiences in their Boleros. The YouTube channel of the brand has received more than 2 million views. Bolero has also been associated with popular celebrities such as cricketers Gautam Gambhir and Robin Uthappa who own a Bolero Stinger and a Bolero Special Edition, respectively. April 16 2012, Mumbai: Mahindra & Mahindra Ltd. (M&M Ltd.), India's leading SUV manufacturer, today announced that its flagship Sports Utility Vehicle (SUV) brand, the Bolero touched a new milestone, having sold 1,00,686 units in FY 2011-12. This is by far its highest ever annual sales since inception. The Bolero is yet again the highest selling SUV in India for the 6th consecutive year with sales of 1,00,686 units during FY 2011-12 as against 83,112 units during FY 2010-11, registering a growth of 21%. For the month of March 2012, the Bolero sold 10,026 units, which is the highest ever monthly sales, in the history of the brand. Further, all these have helped the Bolero notch up the 7th position among the top selling passenger vehicles in India in FY 2011 – 12, moving up from 9th in FY2010 – 11. What is significant is that the Bolero is the only SUV to feature among the top 10 selling passenger vehicles in India. Speaking on this achievement, Pravin Shah, Chief Executive, Automotive Division, Mahindra & Mahindra said, "The fact that Bolero has sold more than 1 lac units in FY 2011-12 signifies the confidence consumers have on the brand. Over the years, Bolero has evolved with the changing lifestyle aspirations of customers resulting in an exceptional CAGR of 26%. I am sure that the Bolero will continue to be as popular on Indian roads in years to come". Since its launch in August 2000, the Bolero has evolved significantly, incorporating a host of features and aesthetics in line with the changing lifestyle and aspirations of the Indian consumers. 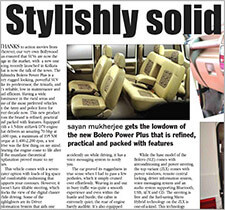 The Bolero kept up its momentum with constant product upgrades and new offerings, having launched the 'New Bolero' recently. Powered by the refined, peppy new m2DiCR engine with better driveability and excellent fuel efficiency, the New Bolero, sports more macho front styling, giving it an aggressive stance. It also incorporates new technology features like Advanced Digital Display with Driver Information System (DIS) and a digital Engine Immobilizer, all new stylish dashboard, new wood-finish central console and all-new seats and upholstery. The brand's popularity is also visible in the online space. The Mahindra Bolero community on popular social networking site, Facebook, has over 5.7 lakh fans sharing their adventures and experiences in their Boleros and Youtube channel of the brand has received more than 16.5 lakh views. Bolero has also been associated with popular celebrities such as cricketers Gautam Gambhir and Robin Uthappa who own a Bolero Stinger and a Bolero Special Edition, respectively. A USD 14.4 billion multinational group based in Mumbai, India, Mahindra employs more than 144,000 people in over 100 countries. In 2011, Mahindra featured on the Forbes Global 2000 list, a listing of the biggest and most powerful listed companies in the world. Dun & Bradstreet also ranked Mahindra at No. 1 in the automobile sector in its list of India's Top 500 Companies. In 2010, Mahindra featured in the Credit Suisse Great Brands of Tomorrow. In 2011, Mahindra acquired a majority stake in Korea's SsangYong Motor Company. Mumbai, September 8, 2011: Mahindra & Mahindra, India's largest selling Utility Vehicle (UV) manufacturer today announced the launch of the 'New Bolero'. Powered by the refined, peppy new m2DiCR engine with better driveability and excellent fuel efficiency, the New Bolero sports more macho front styling, giving it an aggressive stance. It also incorporates new technology features like Digital Cluster with Driver Information System (DIS) and a digital Engine Immobilizer, all new stylish dashboard, new wood-finish central console and all-new seats and upholstery. The New Generation Bolero, available in 3 variants - SLE, SLX & ZLX, starts at an attractive price of Rs 6.33 lacs (ex showroom Delhi, SLE BSIV variant). Speaking at the launch of the New Bolero, Dr. Pawan Goenka, President, Automotive & Farm Equipment Sectors, Mahindra & Mahindra Ltd., said, "The Bolero has reigned as India's highest selling SUV for the last 5 years in a row. The launch of the aspirational new Bolero further enhances its brand equity of being tough, rugged and durable. I am sure that the New Bolero will heighten its appeal not only amongst its core customers but also amongst the youth, further adding years to its life cycle". The smart exterior of the New Bolero is further complemented by its premium dual-tone interiors. Be it the all new stylish dashboard with a wood finish central console, comfortable seats with additional cushioning, drop down arm-rest on the middle row, a sophisticated digital display or the exciting new colour schemes for trims and upholstery – they all add to the SUV's style quotient. Even the steering wheel comes with the specially designed ergonomic thumb grips for a better feel while driving. Since its launch in August 2000, the Bolero has evolved significantly, incorporating a host of features and aesthetics in line with the changing lifestyle and aspirations of the Indian consumers. This has resulted in the brand growing at an exceptional compounded annual growth rate (CAGR) of 27%. It has also been India's highest selling SUV 5 years in a row, since 2006, selling 83121 vehicles in 2010-11. The brand's popularity is also visible in the online space. The Mahindra Bolero community on popular social networking site, Facebook, has over 2.91 lakh fans sharing their adventures and experiences in their Boleros. Bolero has also been associated with popular celebrities such as cricketers Gautam Gambhir and Robin Uthappa who own a Bolero Stinger and a Bolero Special Edition, respectively. A US $12.5 billion multinational group based in Mumbai, India, Mahindra employs more than 1,37,000 people in over 100 countries. Its flagship company Mahindra & Mahindra Limited is the only Indian automobile manufacturer to feature in the top 10 list of the Carbon Disclosure Leadership Index in India - 2010, created by the Carbon Disclosure Project (CDP). May 16 2011, Mumbai: Mahindra & Mahindra Ltd. (M&M Ltd.), a part of the US $11.1 billion Mahindra Group, today announced that its flagship Sports Utility Vehicle (SUV) brands, the Bolero and Scorpio, touched new milestones during FY 2010-11. The Bolero is yet again the highest selling SUV in India for the 5th consecutive year with sales of 83,121 units during FY 2010-11 as against 70,554 units during FY 2009-10, registering a growth of 18%. This is also its highest ever annual sales since inception. The Scorpio has achieved sales of 43,438 units during FY 2010-11 which are its highest since launch. This is in comparison to 36,463 units during FY 2009-10, a growth of 19%. Further the exports volumes of the Scorpio witnessed a growth of 62%, having stood at 17,138 units in FY 2010 - 11 as compared to 10,567 units in FY 2009-10. Speaking on this achievement, Mr. Vivek Nayer, Senior Vice-President, Marketing, Automotive Division, M&M Ltd., said, "It is a very proud moment for us, as both the Bolero and the Scorpio have achieved new milestones, which further reaffirm their popularity as brands which are much loved and admired by customers. The fact that both Bolero and Scorpio have topped the SUV/MUV segment in the TNS Total Customer Satisfaction Study in 2009 and 2010 respectively is also a clear validation of this fact". Since its launch in August 2000, the Bolero has evolved significantly, incorporating a host of features and aesthetics in line with the changing lifestyle and aspirations of the Indian consumers. Having sold 83,121 vehicles in FY 2010-11, Bolero became the first SUV in India to surpass the 50,000 sales mark for 4 years in a row. The brand's popularity is also visible in the online space. The Mahindra Bolero community on popular social networking site, Facebook, has almost 1.7 lakh fans sharing and updating their experiences. Bolero has also been associated with popular celebrities such as cricketers Gautam Gambhir and Robin Uthappa who own a Bolero Stinger and a Bolero Special Edition, respectively. Launched in 2002, the Mighty Muscular Scorpio won three 'Car of the Year' awards (BBC World's Wheels, CNBC Autocar, BS Motoring) in its launch year and is one of the most awarded automotive brands in the country. Through 2010-11 as well, it edged out most SUVs and emerged 'The Most Appealing Sports Utility Vehicle' in the J.D.Power Asia Pacific 2010 India APEAL (Automotive Performance, Execution and Layout Study). The Scorpio also topped the SUV/MUV category in the TNS Total Customer Satisfaction Study 2010. Further, the Scorpio was ranked highest in the SUV segment, in 'Best Looks' & 'Best Resale Value' in the HT-MARS Customer Satisfaction Survey 2010. Known for its inherent tough and rugged 'Mahindra DNA' , the Scorpio continued to outperform other SUVs in 2008, 2009 and 2010 at the Raid de Himalaya, one of the most gruelling rallies on the Indian motorsports calendar. The magic of the Scorpio is reflected in the array of impromptu fan clubs initiated by customers over the years. The brand is also strongly represented by its customers in the virtual world: from thriving Scorpio communities on the web, to Scorpio owners exchanging notes and sharing online travelogues on blogs and various other fora. Today, its popularity can be gauged by the fact that it is the No.1 Auto Brand on Facebook India & the only Auto Brand in the Top 15 brands of Facebook. Currently, the Scorpio fan base on Facebook has crossed 4.6 lakhs. The Mahindra Group focuses on enabling people to rise. Mahindra operates in the key industries that drive economic growth, enjoying a leadership position in tractors, utility vehicles, and information technology and vacation ownership. Mahindra has a presence in the automotive industry, agribusiness, aerospace, components, consulting services, defence, energy, financial services, industrial equipment, logistics, real estate, retail, steel and two wheelers. A US $11.1 billion multinational group based in Mumbai, India, Mahindra employs more than 117,000 people in over 100 countries. In 2011, Mahindra featured on the Forbes Global 2000 list, a listing of the biggest and most powerful listed companies in the world. Dun & Bradstreet also ranked Mahindra at No. 1 in the automobile sector in its list of India's Top 500 Companies. In 2010, Mahindra featured in the Credit Suisse Great Brands of Tomorrow.